The survey results indicated that the vegetation on the Offwell project site was making slow but steady progress towards becoming a dry heath community. Heather (Calluna vulgaris) was present in many areas of the site and was gradually spreading. (Its % frequency had increased from 6 - 12% over the three year period). The mean % cover for Heather over the whole site was 1% in 1996. This had increased to 4.7% by 1998, with Heather now the eighth most dominant plant overall on the heathland in terms of percentage cover. In some areas of the site (section 9), Heather was the dominant plant by 1998. 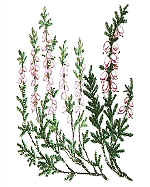 Bell Heather (Erica cinerea - left), while less common, had also increased from 0.8% - 3% frequency over the same period. Bell Heather is taking longer to become established. Its overall percentage cover in 1996 was 0.1%. This had increased to 0.6% by 1998. Re-seeding with heather cuttings/seed from other heathland areas has not been necessary on the project site. Heather and Bell Heather are regenerating naturally. They are either regenerating from seed banks still viable in the soil, or from seed dispersing onto the project site from adjacent areas in the Woodland Education Centre. 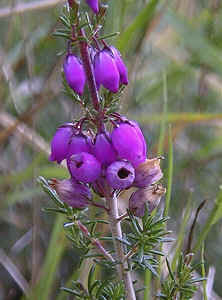 These species are found growing freely in several areas of the Centre, indicating that conditions are generally favourable for heathland vegetation over much of the region. It is likely that in the past much, if not all of the area, was covered in heathland. This makes the task of regenerating heathland much simpler because the necessary conditions are already present. Cross-leaved heath (Erica tetralix) has not so far been found on the project site. This species is characteristic of wetter heathlands. The other most noticeable component of heathlands, Gorse, was now well-established on the site. European Gorse (Ulex europaeus) was one of the most dominant species overall, although its dominance was gradually decreasing. Mean % cover of Common Gorse decreased from an initial high of approximately 18% in 1996 to stabilise at around 9% cover in 1997 and 98 . This is likely to be due to increased competition with other species on the site, in particular with grasses such as Common Bent and Yorkshire Fog. Common Gorse is normally confined to the margins, boundary banks and areas of disturbed soil on well-established heathlands. It seldom occurs on open heath where it is replaced by either Dwarf Gorse (Ulex minor) or Western Gorse (Ulex gallii). Western Gorse, as its name suggests, occurs mainly in the west of England. Dwarf Gorse is the eastern species. The ranges of these two species overlap to the east of Devon, in Dorset. 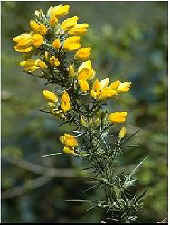 Western Gorse occurs in other areas of the Woodland Education Centre, but was not found on the project site until 1998. It was then represented by two small plants.